Home > Kitchenware > Bakeware > Nonstick Cookie Baking Sheet 15"x10"
Bake cookies, pastries, biscuits and rolls, pizza, tater tots and fries or use to reheat a sandwich. Full sides all around allows you to make jelly rolls, fudge and candy. 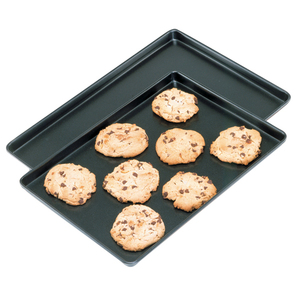 High quality nonstick surface for easy release and cleaning. Even surface for baking and reheating. Measures, 15"/38cm long by 10"/25.5cm wide by .5"/1.25cm deep. Hand washing recommended.